Today I will tell you about a strange glitch that happened to one of my Android devices this week. I decided to change the ringtone on my old Galaxy S4 (i9500) running Android 5 which I use now as my secondary cell phone. Thus, I prepared a small mp3 file that contained a short loop of a track and uploaded it to my Galaxy phone via USB cable. I stored the file into device’s memory because I don’t use a memory card on this phone. As far as I remembered it was necessary to store audio files in the \Ringtones\ or \media\audio\ringtones\ folders if you want your device to be able to detect it and show in the list of available ringtones. After I uploaded the mp3 file I disconnected the phone from my desktop PC, opened the Settings > My device > Sounds and notifications but I couldn’t find my new ringtone in the list. I remember that in the past I used to upload a new mp3, ogg or wav file to my Samsung Galaxy S4. Why you cannot set an mp3, ogg or wave file you’ve uploaded as a ringtone on Galaxy S4, S5? 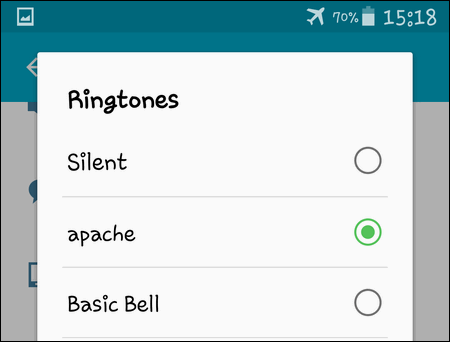 Once I’ve done the hard reset my Galaxy phone detected audio files uploaded to \Internal Memory\Ringtones\, displayed them in the available tones list and I could set one of them as my ringtone: Maybe it will be useful for someone.